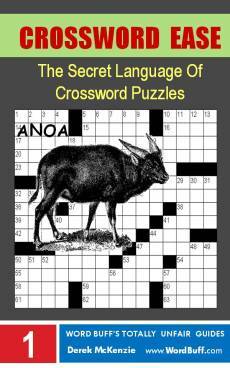 What is it about Crossword Puzzles? I mean, we all know they improve your vocabulary, and they're supposed to put the brakes on Alzheimers Disease, and all that jazz, but Jim Horne's answer above gels much better with me. If it gels with you too, then hang around. Why? Because I've put together a whole bunch of pages to help you squeeze more 'chemical goodness' out of your hobby. And what's more... if you can't find what you're looking for on one of the following pages JUST ASK ME, by visiting Word Buff's Crossword Help Line. I answer most questions within 48 hours. I'm always chasing interviews with interesting word-buffs. Whether it's puzzle champions, software creators, game inventors or just fascinating eccentrics, I track them down and publish our discussions in the Word-Buff Interview Room. Now and then I come across a terrific resource for cruciverbs. Sometimes it's a 'must-have' book or DVD, other times it's a nifty tool for making or solving puzzles. Looking for others to share your passion for word puzzles? I'm scouring the Web for activities, events and organizations that get word-buffs together to enjoy their hobby in good company. Finally, if you're just browsing to kill some time, here's a fun article you might like. It's the lonely story of Garson Hampfield - the only man in the world with the occupation of Crossword Inker.